Server Maintenance On August 10th. This week, our beloved server has turned two years! And to celebrate it, we bring to our players a week filled with joy, great promotions and susprises! 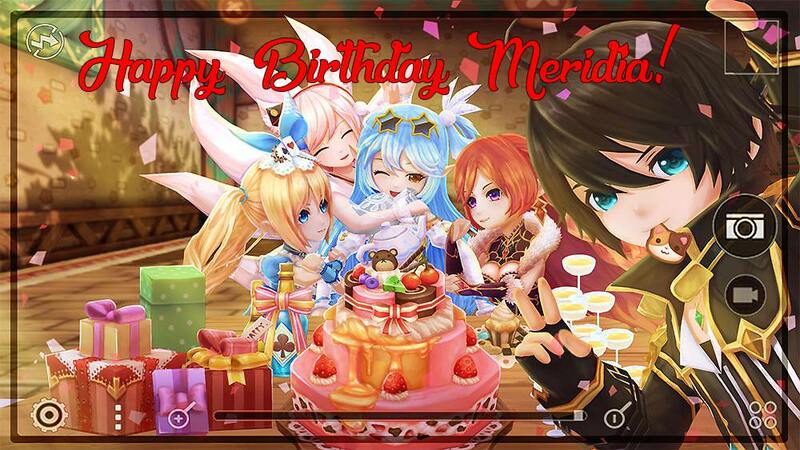 Happy Birthday Meridia! Available for one week, until August 17. You spoke, and we listened! On this week's astral puzzle edition, we have bring some of the most voted items of Claire's "Astral Puzzle of Choice" Event. So are you excited to see what made the cut? All kind of consumables were repetitively voted by our players. And you will find them for a week in our Puzzle! - Guarantee Evolution Scrolls for Gear, Accessories and Trinkets! - Astral Field Fortune Bags. - Exp Items; including 24 hour and 7 days stars, and 7 days VIP contracts. - Senshi Stones and Evolution Keys. Available for one week, until August 17. It wouldnt really be a party without some celebration items! On our second Astral Puzzle available this week, you will find all kind of fashion items to get this party started. - Release of Melody's Costume Set and Microphone Costume Weapon. - Melody will bring the music and Charlotte will bring the magic tricks. Both of their senshi contracts will be available. - Celebration Balloons, Pizza, and of course... Birthday Cake! And much much more fashion! Available for seven days, from August 13 to August 20. If a puzzle devoted to consumables isn't enough to gear up, our weekly promotions will be filled with evolution, exp and pve items at great prices. Enjoy this edition to become stronger than ever! If players were waiting for the special oppotunity to complete their senshi collection, this will be the perfect opportunity! Both shops will be filled with all kind of Contracts, making a lot of our senshis available for a week! If you are filled with nostalgia over these two years, so are we! Both stores will include some of the fan favorite costumes over time. So if you were missing them from your collection, this is the time to grab them! Our Monster Hunt will be changing and will be available for this and the following month. It will be filled with consumables and helpful items; loyalty, formulas, astral crystals, golden pages, and much more! Double EXP and Class Exp Event! Celebrations continue with a special double exp and class event, available from August 13 until (starting at about 4pm -server time-) until August 17. Five days to level up your favorite classes, and getting ready for the arrival of new content soon! In addition to our celebrations, we will give our donators a big thank you for keeping our server alive all this time. From August 13 until August 17, players will receive a 25% bonus coins on each paydrake card they use in our website. We didnt get voodoo dolls this year ? why ? Last edited by HellsOlivia; 08-12-2018 at 03:13 PM.